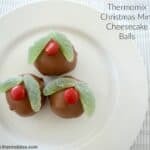 These Thermomix Christmas Crackles are the perfect recipe to make with the kids! 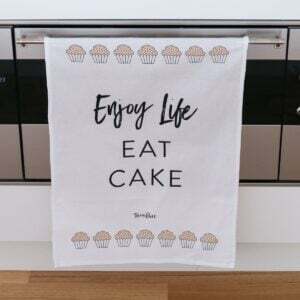 With the school holidays fast approaching (eek!) I’m on the look out for simple activities to help keep the boys amused in the lead up to Christmas. 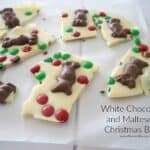 This Thermomix Christmas Crackle recipe makes a fun activity and also doubles as a great homemade gift for friends. This recipe is based on our Thermomix Chocolate Crackles with the addition of white chocolate and a lolly ‘holly leaf’ decoration on top. 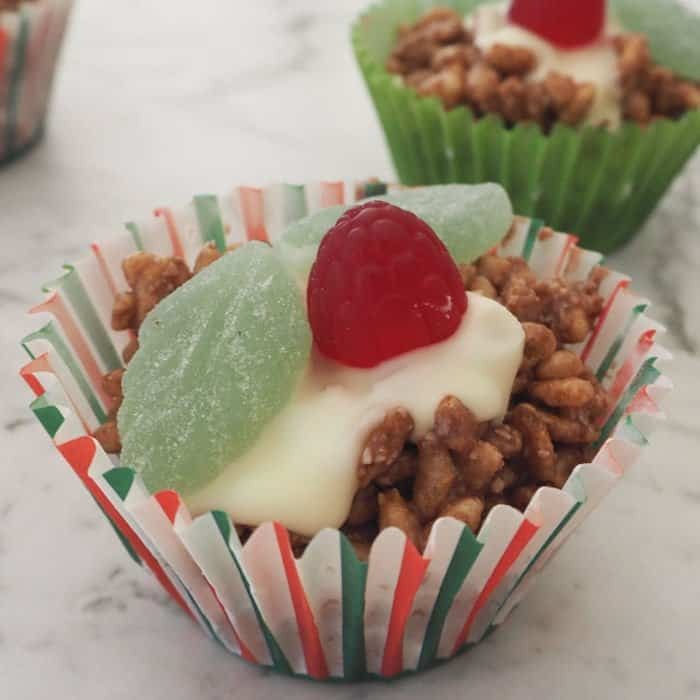 You won’t beed all of the raspberries or mint leaves in the bag for this recipe, so make sure you pop some away for yourself to enjoy so that the kids don’t eat them all! 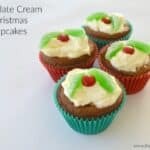 For more Christmas recipes to make with the kids, check out this post. 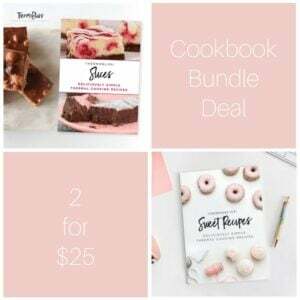 You can also find more no bake Christmas recipes in our ‘Thermomix No Bake Christmas‘ eBook – also available in a bundle pack too. 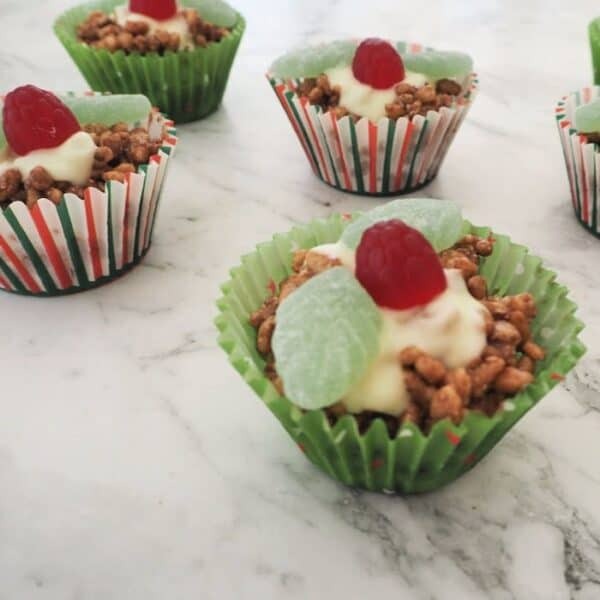 This easy Thermomix Christmas Crackles recipe couldn't be easier to make - or eat! Place 12 paper cupcake cases into a 12 hole muffin tin and set aside until needed. Place the coconut oil, icing sugar and cocoa into your Thermomix bowl and cook for 3 minutes, 70 degrees, speed 2 or until melted and combined. Add the coconut and rice bubbles and mix for 5 seconds, speed 4 on reverse to combine. Scrape down the sides of your Thermomix bowl and mix for a further 5 seconds, speed 4 on reverse or until the mixture is well combined. Divide the chocolate crackle mixture between your prepared cupcake cases and gently smooth the surface. Break the white chocolate into squares and place in a microwave safe bowl. Cook on 30 second spurts until melted. Add a little white chocolate to the top of each chocolate crackle and then decorate with a raspberry and mint leaf. Place the chocolate crackles into the fridge for 30 minutes to set. This recipe makes 12 chocolate crackles. Once set, store these Chocolate Crackles in an airtight container in your fridge for up to one week.